Capacitors are charge-storing devices. In speaker crossovers, they serve to block out low frequencies to the speaker drivers. For the layman, capacitors only present 1 attribute, that is capacitance (measured in microFarads for speaker caps, the voltage rating is usually much higher than is required and can thus be ignored in conventional speakers). 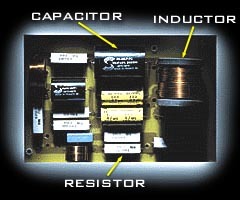 Speaker capacitors come in various types. The more popular ones being electrolytic (non-polar ... please! ), mylar, (metallized) polypropelene and polystyrene (plastic film) caps. There are even some exotic caps using teflon in its construction. If there is only 1 value, i.e. capacitance, why do we bother with having so many different types of caps?! The simple answer is that they all sound different. Some caps sound "slow" and veiled, whereas others sound "fast" and transparent. They all add different characteristics to the sound produced, thus IMHO, proper selection of caps is required on the part of the speaker designer to produce a good sounding speaker. Yet there are many speaker manufacturers who place cost as their top priority and use the cheapest parts available. Capacitors can have applications in both the high pass (tweeter) and low pass (woofer) crossover sections. Thus, in speakers using such crossovers, both high and low frequencies are affected by the capacitor that is used. The most important capacitors are the ones in series with the tweeter. These, when changed, can have a very appreciable effect on the sound of a speaker. In general, capacitors (components) that are in series with the drivers affect sound more than those in parallel with the drivers. Capacitors can also be changed, sort of like tubes in a tube amp... although some soldering skill is needed. Yes, it is fun to change caps and appreciate the CHANGES in sound. But it takes an experienced person to know what caps to use in a particular speaker to tweak the sound towards his liking, otherwise, I foresee a little fortune being spent on changing caps! Knowing which caps to change to have the greatest effect, and what caps to use, require knowledge that comes from both personal experience and reading about others' experiences (that's what the Internet is about : ). Resistors can be found in many speaker crossovers, usually to match one driver's loudness to that of another (They also have applications in other more complex crossover circuits that I shall not elaborate on here). Resistors have the attribute of resistance (measured in Ohms). Once again, despite having only 1 useful attribute that we commonly know, they all sound different. All these make speaker crossover design seem like a black art ... it is ... in some ways. Again there are several types of resistors, eg. wire-wound, carbon, metal foil, etc. . In speakers, the wire-wound resistor is favoured by some for the large surface area of the actual conductor within the resistor. To me, whichever resistor gives me the sound that I like best, IS the best, in that particular application. Yes, crossovers are affected by vibrations, just like all hifi equipment. It is good if a crossover is isolated from these devils. In examples such as Wilson Audio, Sonus Faber, (some of) their speakers have isolated crossovers that are potted in resin (such as epoxy). The worse place to locate a crossover, where vibration control is concerned, is actually directly behind the drivers. Yet, this is the most common place for manufacterers to site their crossovers, for it also has the obvious benefit of having shorter internal speaker wiring. (There are always pros and cons, a good design can perhaps alleviate both problems...) I feel that the best place for a crossover is OUTSIDE the speaker, in its own separate damped enclosure. Some crossover components are less susceptive to vibrations than others, but it is no harm to isolate them from vibrations as well. Crossover components can also interact with one another, especially so for inductors due to their magnetic fields. In theory, inductors should be as far apart as possible, and they should be at 90 degrees to one another to minimise magnetic field interactions. This is another reason why crossovers should not be directly behind the drivers themselves, for the drivers also have magnetic fields that will mutually interact with these crossover components and degrade sound. Caps are also affected, but to a smaller extent. I personally prefer crossovers that are hard-wired, for these have less solder joints and also have less signal running through PCB traces (Printed Circuit Board). Many manufacterers use PCBs as they are easier to assemble. This is the conclusion for this article, which is essentially an introduction itself to speaker crossovers. There is a lot more to the crossover than what is mentioned here, but I hope this article gives you somewhere to start reading, before you embark on reading more about them.